If you’re a very keen student, a (wannabe) English teacher, accent/dialect coach and you’re interested in finding out a lot more about accents and English phonetics & phonology, you’re in the right place! This is the Number 1 book that I recommend to everyone. I haven’t found anyone who doesn’t think it’s fantastic. If you want a comprehensive introduction to phonetics and phonology, this is the place to start. Non-native speakers will learn a huge amount about English pronunciation, and English teachers will have a better knowledge of what to teach. Easy to understand – beginners are welcome! The book takes you from how we produce speech physically to more abstract ideas such as the phoneme, allophone and syllable. Covers how to produce all English sounds and shows common spelling patterns. Sections on rhythm and intonation. Explorations of accent variation (UK, USA, South Africa, Australia). Details the sound systems of Spanish, Japanese, French, German, Polish & Italian. Examples of how the pronunciation of English changes over time (from Old English to present-day English) as well as very recent consonant and vowel changes (within the past century). This is helpful to understand how people speak in Britain today (some pronunciation textbooks will advocate a conservative, old-fashioned accent). Very clear glossary at the back explaining linguistic terminology. Audio CD and online materials. Interesting essays at the end (including RP – R.I.P?, Making Computers Talk, & Using Phonetics in Criminal Investigations). Fun & friendly books aimed at actors, but can be used by anyone interested in how accents work. The first book is about accents in general, whereas the second focuses specifically on Standard British English (both neutral and posher varieties). If you want to explore accents in a non-academic way, these are the books for you. English teachers / dialect coaches will find creative ideas in here, too. Examples of accent variation geographically (Manchester, Belfast, Wales, Cockney, Newcastle) and across time (different varieties of RP within the past century). Exploration of abstract concepts such as zone, tone & direction, which can be useful for non-academic learners. Engaging ideas to understand/practise rhythm and intonation. Simple explanations of how to hold your mouth muscles for different accents and the resulting hesitation sound. Audio files accompany the book (either CD or online download). A treasure-trove of exercises designed to give you control of your speech muscles and create any sound listed in the International Phonetic Alphabet (useful if you’re learning a foreign language). Every page guides you through practical exercises to help you learn. English teachers and dialect coaches will find loads of ideas here about how to get someone to produce an unfamiliar sound. Encourages the reader to do practical exercises on almost every page. Covers how to produce all sounds in the International Phonetic Alphabet. Examples of sounds are given in words from different languages, such as the [ɸ] sound in Japanese [ɸɯdʑi] (=Mount Fuji). Exploration of sounds that are voiced, voiceless, breathy, creaky, implosive, ejective, clicks, nasalised, palatalised, velarised, and pharyngealised. Diagrams with very precise explanations of where muscles (tongue/lips) move to create particular sounds. Explanation of how to make the Cardinal Vowels. Brian Mott’s English Phonetics & Phonology for Spanish Speakers is a fantastically useful book detailing the differences between the sound systems of English, Spanish and Catalan. It also contains in-depth information on phonetics & phonology in general, English rhythm, stress & intonation, plus very interesting information on historical sound change. Exercises (and answers) are included along with an audio CD. Recommended to anyone – not just Spanish speakers. However, it’s a dense text – not a light read! Introductory Phonology by Bruce Hayes is an easy-to-understand text for beginners (note phonology, not phonetics). It takes the reader through phonemic analysis, phonological alternation, morphophonemic analysis, syllables, stress, tone and intonation. Plenty of examples to work through from different languages, however some of the exercises do not have answers. Aimed at actors and dialect coaches, Speaking with Skill by Dudley Knight gives you the tools to develop better proprioception and control of your articulators. Practical exercises are given to isolate and control all major muscles involved in speech. The reader is guided through exercises to explore the sound possibilities that the mouth can produce until s/he is led to produce the sounds of the IPA. The concept of oral posture (similar to voice quality) is explored, which is vital to accent work. A very useful audio DVD accompanies the book. A Course in Phonetics by Peter Ladefoged and Keith Johnson is comprehensive and very well-written book covering all the major topics of phonetics as well information on acoustic phonetics (such as interpreting spectrograms). My copy came with an audio CD but the latest edition has a companion website which looks much better. Certainly one of the best introductory phonetics courses around. Voice Work by Christina Shewell is a very comprehensive text dealing with a wide range of subjects. The author is a speech and language therapist and a theatre voice teacher, which allows her to give both scientific and artistic insight. This is book for teachers or coaches who want to broaden their knowledge beyond the field of phonetics. It also clearly explains artistic terms, like resonance and head voice, in a scientific way. It is full of very useful information and practical exercises. Sounds Interesting is by British phonetician John Wells, who writes a very entertaining book complete with observations and anecdotes as to how words are pronounced in English and other languages. Sounds Fascinating contains more interesting phonetic insights from John Wells. Accents of English by John Wells is a comprehensive work on accents – how and why they differ. This volume introduces the concept of lexical sets (FLEECE, KIT, TRAP, PALM, etc.) and explains some sound changes that have taken place within the history of the English language. This is not a book for the complete beginner. Accents of English 2 covers accent differences within the British Isles including RP, London, Yorkshire, Merseyside, Tyneside, Wales, Scotland, and Ireland. Accents of English 3 looks at accents across North America, Canada, The West Indies, Australia, New Zealand, South Africa, India, Africa and East Asia. In casual conversation, English speakers don’t use dictionary citation forms. Sound Patterns of Spoken English by Linda Shockey examines the changes that occur in spoken English in great detail (for example: I think my as [ə̃ɐˈθɪ̃mɐɪ]). This is not just about weak forms. Very interesting, but not for beginners. If you’re interested in why people sound different even though they’re saying the same vowels/consonants, then The Phonetic Description of Voice Quality by John Laver might explain a few things. You may have heard of articulatory basis/basis of articulation, the setting or oral posture – this book uses the term voice quality to describe a similar concept. Not an easy text to read, but very interesting. You’ll need to have a good knowledge of phonetic terms to get into this book (as there is no audio CD to demonstrate examples). If you’re interested in the names and functions of all the muscles that produce speech, Articulatory Phonetics by Bryan Gick is the book for you. Information is also given on techniques to see and measure the vocal tract (such as ultrasound, palatography, MRI). Fed up of studies of British and American English? Want to find out about sounds in a humongous variety of languages across the world? The Sounds of the World’s Languages by Peter Ladefoged and Ian Maddieson is the book for you – full of diagrams and studies. This is not for the beginner. English Accents & Dialects by Peter Trudgill gives a good overview of accents and dialects across the UK. It includes analyses of speech varieties in London, Aberdeen, Hull, Manchester, Southampton, Lancashire, the Shetlands, Bristol and Devon among many others. Audio recordings are available on the companion website. If you’re a bit of a geek when it comes to phonetic symbols, then you’ll enjoy the Phonetic Symbol Guide by Geoffrey K Pullum. Particularly useful if you’re reading academic material and want to understand the value of the symbol being used. Gimson’s Pronunciation of English by Alan Cruttenden is the authoritative text on the contemporary Standard British accent. Information is given on the history of English’s sound system (from Old English onwards) as well as more recent changes (from RP to a contemporary English accent). All the vowels and consonant sounds are covered in detail, as well as connected speech processes. Some advice is given at the end for teaching pronunciation. 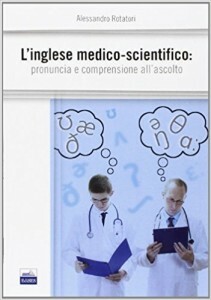 If you’re an Italian medical professional and you speak English at work, you must buy this book! L’inglese medico-scientifico. Pronuncia e comprensione all’ascolto is an invaluable resource for those wishing to improve their pronunciation in English. The author Alessandro Rotatori’s focus is on contemporary British English, but American variants are helpfully provided. Online materials are available on the companion website. Alessandro Rotatori, has once again produced a really fantastic resource for medical professionals in Health care professionals speaking. 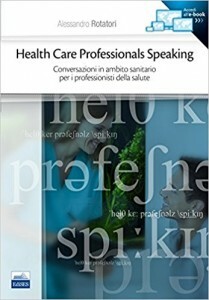 Conversazioni in ambito sanitario per i professionisti della salute. The book includes guidance on modern pronunciations, vocabulary and grammar as well as realistic dialogues that the reader is likely to encounter in the workplace. Online materials are available on the companion website. Consigliato! Longman Pronunciation Dictionary by John Wells comes with a CD (only works on PCs, not Macs), which is really helpful to look up pronunciation variants. Some of the entries have pie charts showing which pronunciation is more popular or an indication as to what older and younger speakers prefer to say. Not a phonetics book, but Michael Swan’s Practical English Usage is the best grammar book I’ve found. Clear explanations and examples are given for all those tricky grammar points. If you need a handy reference guide, this is it.